I love the mornings. 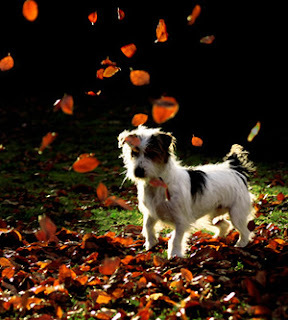 Sipping my coffee and watching the dogs cavort through the autumn leaves is best time. Although we seem to be lacking the autumn nip in the air I am not complaining. Sipping my coffee, I go through the upcoming events of the day. Who is being dropped off? Who is being picked up? Make time for blogging, play a little Farmville and pay the bills. Funny how I can go through the entire days schedule in my mind and the day is never what I had planned. He is a dog with a job that he takes very seriously. He nudges me out of bed and tells the guests, “You must let her have two cups of coffee! She will not talk to us until she has had her coffee.” He boldly herds them out into the early morning darkness to patrol the grounds. He finds his spot on the hill and keeps a diligent eye on them. Thumper is a wonderful dog who watches over the guests and makes sure they are comfortable. I never picked this dog, he picked me and we work so well together. Even when he is napping one eye is always watching to make sure the guests are happy.